January 28, 2012 | Posted by Lee C.
Over the last few years, mattresses have been increasing in height. Today’s breakthroughs in mattress design allow for more padding while still offering the support of a strong mattress. The question is – what is the right height for a bed and mattress when it comes to you. 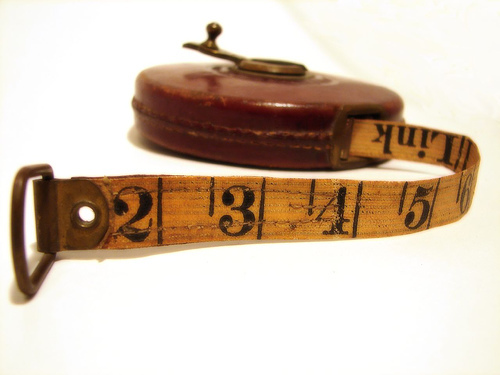 Here are a few ways to determine the proper bed and mattress height. The standard with bed height is that your feet should rest on the floor when you sit on your bed. Typically this has been about 22 to 25 inches tall. However, this has changed in recent years, as people have been willing to go higher in bed if it means more comfort. As a result, it can be difficult to find a bed that allows your feet to touch the ground. To offset today’s tall mattresses, there are platform bed options that lower bed height while still accommodating a taller mattress. There are also low profile box springs. Comfort is the ultimate determinant in most mattress decisions. It’s so important to get a good night’s rest that people often want the most comfortable mattress possible. It really is no compromise on price for most people if it means a relaxing, peaceful night of sleep. Today, technology now allows for a mattress to have firm support, which improves durability while still having a soft, comfortable top that conforms to your body’s natural position. Pillow top mattresses are also popular. People love the feeling of falling into bed and being covered into almost a cocoon-like state. If you do prefer a softer bed, a taller mattress is likely the ticket. If this is the case, custom fitted linens are often a necessity as most manufacturers are still trying to catch up to today’s taller mattresses. The last consideration with bed and mattress height is bedroom design. Modern looks sometimes have platform beds with low profile beds. These are often custom-looking beds with only a mattress to go on a bed frame with slat supports. This style offers a sleek, low profile look that some people enjoy. In other cases, the higher mattress and bed has signified a true master bedroom. A high bed was always something to aspire to have and most people still want this look for their own bedroom. These are just three considerations to think about when determining your proper bed and mattress height. What else would you add to this list for someone considering a new mattress? What are some questions you had when looking for a particular mattress height? 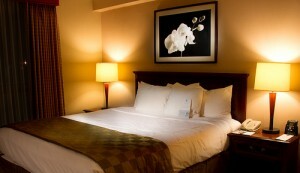 January 23, 2012 | Posted by Lee C.
The comforter is your bed’s first impression. When you walk into your bedroom the comforter is the first thing you will see. It’s the crown jewel of the room. Being it’s the center of attention, it’s important to keep your comforter clean. Here are a few tips to help you with cleaning your bed comforter. Often, your regular washing machine cycle is not best for your comforter. For most comforters made today it is appropriate to use the washing machine, but there are specific settings to use for large, delicate items such as comforters. For common comforter fabrics such as cottons, you can use your washing machine on a delicate setting with cold water. The delicate setting will simulate hand washing that cleans your cotton duvet cover or comforter thoroughly while not damaging the softness of the material. Hand washing is a safe option for most comforters. You can use a deep laundry tub or even your bathtub (we’ll save bathtub cleaning for another article). Use gentle detergent and work your hands through the material. Allow the comforter to soak so as to allow anything in the threads of the comforter to release. To dry your comforter, place it in a place where it can hang. Exposing the comforter to clean air is often the preferred method of drying if available. You can also use the regular clothes dryer, but be careful. Check the tag on your comforter to ensure it is safe for the dryer. Regardless, run the dryer on the gentle cycle with low heat. Leave enough time for the comforter to dry. Shake your comforter each week when you wash your bed linens. You don’t necessarily have to wash your comforter as often as you change your linens. You can shake your comforter often to keep it fresh and free from most dust and debris. You can also vacuum your comforter. Just detach your vacuum’s hand attachment as you pass through when cleaning the bedroom floor. It’s an easy way to clean without having to wash it as often. Be careful with certain materials. Downs and feathers are typically meant for special care. You won’t want to mess around with these at your home unless you’re skilled in certain dry cleaning methods. Take these comforters to the professionals once or twice each year for a thorough cleaning. You can keep them clean by shaking and vacuuming in between. Your comforter is the first thing people notice when they enter your bedroom. Make sure you leave a good impression no matter who visits by taking care of your comforter. Follow these few tips and you should have a fresh and clean comforter all year round. 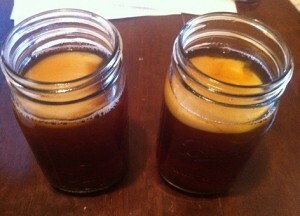 Kombucha Tea ~ What Is It and How Can It Help Me? The first time I heard of Kombucha tea, I wondered why anyone would want to try it. I could not even pronounce the name, so the idea that it would taste good, or be beneficial for me, did not really cross my mind. I got over my skepticism, and I am truly glad I did, since drinking it introduced me to all the amazing benefits of this wonderful tea. Kombucha is really a type of yeast, sometimes also called a mushroom or ‘Scoby’. It is a natural probiotic that contains beneficial bacteria, yeasts and acids that can help our bodies to achieve and maintain overall good health. As a probiotic, Kombucha’s beneficial bacteria, called gut flora, spread and live in the large intestine with the purpose of eliminating harmful micro-organisms. • Regular consumption of Kombucha tea assists in the process of detoxifying the body, since it provides gluceronic acid, which is normally produced by the liver during the body’s detoxifying process. • Kombucha also provides much needed energy boosts to regular drinkers, since a body free of toxins can run and perform more effectively. The energy provided by the tea also comes from the myriad of B vitamins present. These include B1, B2, B6 and B12. Vitamin C is also present, further assisting in the detoxifying process and providing even more energy. • Kombucha tea is great for weight loss. The group of B vitamins present helps the body process fats and proteins quicker while improving metabolism. • This tea is even helpful for people with sleep disorders. A nice cup of Kombucha tea calms the body and spirit, helping people find their natural sleep rhythm so they can sleep better at night. • Kombucha tea helps to strengthen the immune system. It can even aid in fighting off infections because the acids present in Kombucha tea have antibiotic properties. It is also used in preventing and treating acid reflux disease and helping with digestion. • Kombucha tea can also be used to soothe and help with the effects from ailments such as arthritis, bronchitis, chronic fatigue, diabetes, cancer and many others. Important Note: NEVER touch the kombucha mushroom with a metal instrument (ie: knife, spoon, etc.) Metal will kill the mushroom. Only use plastic or wooden utensils. It is also very important to remove any rings when handling the mushroom. It is best to wear rubber gloves to protect the mushroom from any contamination. 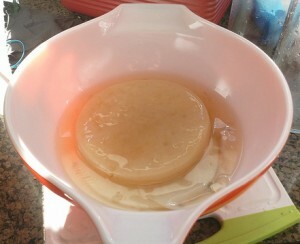 Kombucha Mushroom also called a 'Scoby'. Ingredients: The ratio of the ingredients can be adjusted by the brewer to fit individual tastes. 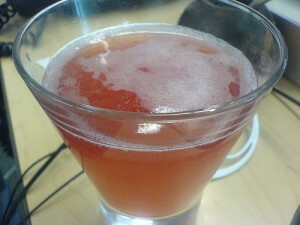 ½ cup starter tea, which is Kombucha tea that has been previously prepared. Step 1: Get a glass container with a wide mouth to brew the tea in. Step 2: Bring water to a boil in a stainless steel pot. Step 3: Add the sugar and stir until it is completely dissolved. Step 4: Add tea bags, steep to desired strength, then set aside to cool to room temperature. Brewing Kombucha Tea in a 1 quart canning jar. Step 7: After 4 or 5 days, begin tasting the mixture until you are satisfied with the taste. Congratulations – You’re Almost Done ! Once you are pleased with the taste, remove the mushroom and any new mushroom that might have formed. (New mushrooms formed during the brewing process are called ‘babies’. They may either be attached to the ‘mother’ or floating within the tea.) Strain the tea through the cheese cloth and pour into a pitcher or a clean canning jar. A perfectly brewed tea will have a slight effervescent fizz, as shown in the image at the top if this page. It is recommended to begin drinking 2 to 4 ounces per day, although you can drink more. Keep in mind that tea is a diuretic, so if you decide to drink more, make sure to keep hydrated throughout the day by also drinking a lot of water. 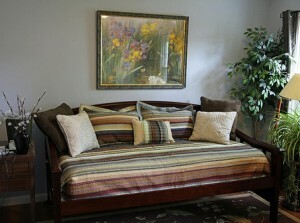 January 16, 2012 | Posted by Lee C.
What comes to mind when you think of a daybed? Images of daybeds often bring about memories of grandma’s spare bedroom. It may have been the sunny corner of the attic where only a few guests ventured to stay. Daybeds seem to have gotten a bad reputation over the years. They are often an afterthought. Most daybeds have been offered with only a gold colored metal frame with floral patterns. The purpose of the daybed still remains. The good news is that there are plenty of great options for re-thinking the daybed today. A daybed is the size of a twin bed. Daybeds are typically enclosed on three sides forming the look of a couch with a large seating area. This is where the appeal of the daybed originated. Daybeds have been used for spare rooms that allow for a single guest to sleep while leaving the room open to normal activities like sitting and visiting during the daytime. Because the daybed brings about memories of floral patterns and gold metal frames, it is often forgotten in modern room designs. But the space saving advantages of the daybed make it perfect for a variety of modern rooms. Daybeds are perfect for offices, family rooms and even dining rooms. A daybed typically takes up about the same space as a regular couch. Daybeds are a few inches deeper than typical sofas. But your company will much prefer resting on an actual mattress rather than a sofa when they visit. For the modern office, either at work or at home, a daybed offers a great a place for reading and dozing off for a quick afternoon nap. There are modern designs that offer sleek lines and contrasting accents. Linens for daybeds can be matched to meet the setting of the room. No longer does floral have to be the norm for modern daybeds. If you have a home that lacks enough space for all the company you can have staying over on weekends then a daybed is a great option for the living room or sitting room. You can use the bed as a place to sit and watch movies during your regular days at the house and use it as a bed when company visits. There are places for daybeds in just about every home. You can have company over for the weekend and let them sleep in a comfortable bed instead of the mattress. The modern, space saving daybed is just what you need to make your guests feel at home. January 9, 2012 | Posted by Lee C.
Our bodies are wondrous creations! However, as wonderfully made as we are, over time we all face some physical challenges. One such challenge has to do with the way we position ourselves each night when we lay down for bed. A common occurrence many are familiar with is the stiff neck in the morning. The situation often happens when you go to bed really exhausted and fall asleep almost instantly. The trouble occurs if you are unable to correctly position your head on your pillow before you drift off to dream. When your neck gets out of position you will likely experience some discomfort in your neck, shoulders and back the next morning. How can you avoid this situation? Ergonomic pillows present one option, but when you understand the situation you’ll realize there are other options for resting your head each night. Tension is the sleeping culprit. It is tension that often causes stress on the muscles, nerves and bones. This tension creates the dull or even sharp pain often felt in the morning. The design of ergonomic pillows is sound and was created to solve sleeping issues. There is a slight rise in the pillow under the neck, a dip for the head and a rise in the back to further support the head. Ergonomic pillows remind people of stiff foam and discomfort. The discomfort has often made people shy away from using them choosing instead to search for just the right regular pillow. Today, there are options beyond the standard sleeping pillow. For side sleepers, an organic buckwheat pillow might serve well. The height is perfect for the side sleeper as the pillow keeps the spine at the correct angle while providing a solid yet comfortable setting for the head throughout the night. Sometimes a smaller pillow is what people need. Often, your head can get propped up too high on a pillow that is too large. This causes pain. There are even some smaller, adjustable pillows that make it easy to adapt to your personal setting. There are more options than traditional ergonomic pillows. You are no longer stuck with the foam pillows. Check out options like buckwheat, adjustable or even a smaller pillow to see if you can find the pillow that is right for your unique body type and sleeping position. Your body is a remarkable creation. Take care of it and feel great each morning with a pillow designed specifically for you. January 4, 2012 | Posted by Lee C.
There is perhaps no better feeling than climbing into a freshly made bed. The bedroom is a person’s sanctuary and the centerpiece is the bed. The best in the business are the hotels. When a person walks into a hotel room the first thing they notice is the bed. Having this impression at home would be something most of us would love to come home to each night. At home, fitted sheets are something most have for their ease of use. Custom fitted sheets have been an even greater improvement as mattresses have taken on many shapes and sizes over the years. If you have fitted sheets, as most do, you can skip to the Part 2 of the instructions. 1) Spread your standard sheet over the bed. Ensure there is approximately the same amount of material hanging over each side. Create a tight corner by pulling up slightly approximately six to twelve inches away from the first corner. Tuck the corner of the sheet under the bed making sure to spread the sheet under the mattress. Do not bunch the sheet. Next, fold over the part of the sheet in your hand under the bed. Repeat for each corner. 2) The top layer standard sheet comes next. Lay it over the bed, spread evenly on each side. Now, if you want more layers, like a winter blanket to go between your bed and the comforter you can lay it out. Once one or both are applied evenly you can tuck the sides under the corners as mentioned in Step1. Roll back the sheet approximately six to twelve inches back from the top of the bed and tuck remaining overhang. This should leave room for the pillows to rest. 3) Finally, apply the comforter, evenly spread over the mattress. Fold the comforter back approximately six to twelve inches at the head of the bed. There are a few variations to making the bed like a luxurious hotel. It is all about personal preference, but it seems most people like a bed that is made tight, clean and crisp. Make it part of your daily routine to spend about two minutes making the bed. You’ll thank yourself each night. There is nothing like diving your toes down into the tightly tucked sheet. You’ll be sleeping sound just like in a luxury hotel.